IBTM Arabia is part of IBTM’s global portfolio of meetings and events industry trade shows and the most established event of its kind in the Mena Mice industry. It took place at Jumeirah Etihad Towers from March 25 to 27 this year. In response to feedback from customers, the strategy for this year’s event was to focus on becoming fully inbound, so that international hosted buyers meet with suppliers from the burgeoning Mice market in Mena and the surrounding regions. In addition to a packed programme of quality one-to-one mutually matched appointments between suppliers and hosted buyers, IBTM Arabia also included a varied itinerary of venue site inspections and networking activities, as well as insightful education sessions presented by experts and educators on the latest industry developments. Hosted buyers this year included a larger proportion of Chinese buyers (at almost 15 per cent this year) such as Novo Nordisk Pharmaceutical China, HelmsBriscoe Asia, Thyssenkrupp Elevators Asia and Didi Chuxing. Other Chinese Hosted Buyers included China International Medicine Exchange Association International Service Center and World Travel Service Sichuan. European buyers made up almost 70 per cent of buyers, including Framatome (France), Honeywell (UK) and Adevma Communication Ltd. (Germany). Other high-profile buyers at the event included representation from the Azerbaijan branches of BP, Baker McKenzie and OEG Offshore. The calibre of exhibitors was excellent, with new exhibitors including Deputy Ministry of Tourism of Cyprus; Radisson Hotel Group; Nassima Royal Hotel Dubai; Occidental IMPZ Dubai Conference & Events Centre; E2 Dubai South Event & Exhibition Centre; Expo2020 Dubai and Sofitel Abu Dhabi Corniche and returning exhibitors Galaxia MICE Group; Atlantis The Palm Dubai; Georgia Convention Bureau; Matrix Audio Visual & Entertainment; Czech Convention Bureau; Rotana Hotel Management Corporation PJSC; United Nations Conference Centre and Rwanda Convention Bureau. IBTM Arabia’s focus is on quality business meetings, which means that this year the average number of appointments per exhibitor increased to over 35 meetings per exhibitor – the highest number in at least the past three years. About 82 per cent of exhibitors had a full diary. There was an average of 25 appointments per buyer – the highest number in the past two years, and 95 per cent of hosted buyers were new both to IBTM and IBTM Arabia. Further quality checks were instigated to the hosted buyer approval process this year to ensure that buyers show proof of business by way of referrals, and demonstrated that they have intentions to place, or are already placing business within the Mena and wider region. There were 1,234 pre-scheduled appointments in total, 71 per cent (841) of which were mutually matched. Some 40 exhibitors attended from the UAE and surrounding regions; 51 international Hosted Buyers attended. 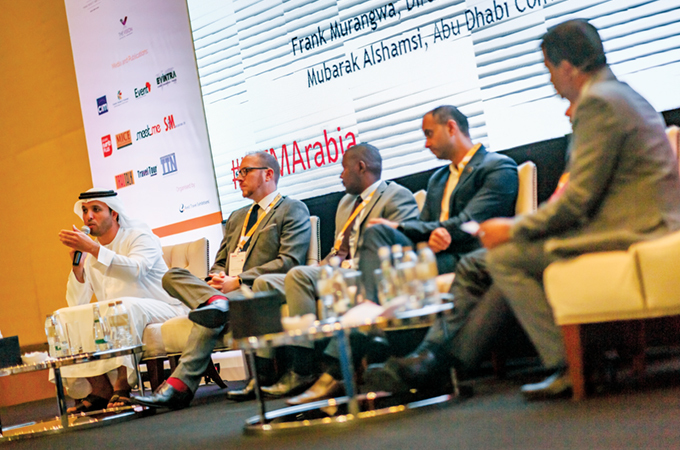 This year there was a new focus for the ICCA panel session, in association with ICCA Middle East, one of the industry’s most established and respected associations. The topic of the session was ‘Business approaches across Cultures’, bringing together panel members from across the Mena meetings and events industry to debate the significant cultural factors influencing how businesses communicate, cooperate and succeed in the Mena region. This year, the event’s renowned ‘Discovery Day’ included a morning of educational sessions followed by an afternoon of venue site inspections and activities, designed to give buyers as much opportunity as possible to experience some of the many great unique venues in Abu Dhabi including Familiarisation trips to either Emirates Palace and Park Hyatt, or YAS Hotel and YAS Circuit. This was followed by a welcome reception for Hosted Buyers and exhibitors at the stylish poolside Chill’O Terrace at the Sofitel Abu Dhabi Corniche. There was a new venue for the event’s much-anticipated gala White Party, which was held this year at the 5-star Saadiyat Rotana Resort & Villas, one of Abu Dhabi’s newest venues located on Saadiyat Island, with striking modern Arabic architecture and uninterrupted Arabian Gulf views. This year’s keynote speech was delivered by Alistair Turner, managing director of Eight PR and Marketing, who presented a session on brand activation at major events and shared case studies on how to maximise the opportunities presented when events arrive at a destination. Also as part of this year’s Knowledge Programme, Shaun Vorster – VP Business programming, Content and Programming, Expo 2020, presented a session on the opportunities presented when the UAE welcomes 190 nations and millions of visitors for a once-in-a-lifetime celebration under the theme ‘Connecting Minds, Creating the Future’.